Official synopsis: "Liam O’Connor should have died at sea in 1912... Maddy Carter should have died on a plane in 2010. Sal Vikram should have died in a fire in 2029... Yet moments before death, someone mysteriously appeared and said, ‘Take my hand . . .’ But Liam, Maddy and Sal aren’t rescued. They are recruited by an agency that no one knows exists, with only one purpose – to fix broken history. Because time travel is here, and there are those who would go back in time and change the past. That’s why the TimeRiders exist: to protect us. To stop time travel from destroying the world . . . The first book in a series that revolves around time travel and an alternate history... what's not to love?! I'd been meaning to read this book since it was released last February and only actually got to buying the book back in January. I started reading it pretty much straight away as the reading pile was quite small after a few days off work thanks to Christmas. And instantly I was transported away from the cold, snow of January and thrust deep into the heart of the story of the Time Riders. I actually kicked myself for not getting it any sooner. Action packed, addictive, and with the perfect amount of humour, I just couldn't put it down. Alex has obviously put so much thought and effort into this book, and it really pays off! The entire concept of this series, the premise, is pretty epic. People on the verge of death, recruited to try and save those that have a life to look forward to from whatever horrors a change in the course of history can cause. Some would wonder: could be be done with the justice and conviction it deserves? Well believe me when I say that it is done brilliant. Alex knows exactly what he is doing. Now, time travel is not a new thing to the world, be it fiction, television, whatever... it's a pretty popular subject. Who doesn't wish they could go back in time to re-live a certain moment? Or to change something - probably do something in a different way or not at all if it turned out not to be a good idea? But what I think the book really gets across is that time is a dangerous thing to mess around with. One little change can spell disaster hundreds of years in the future. The way the time travel is used in Time Riders is actually one of the best uses I've encountered. The way the villain travels back in time, because they're unhappy with their time, to try and make changes. I also have to say that I love the way the history changes. How there need to be 2 different teams - each in one timezone - because the changes made in the past cause an instant change in the future and that needs to be dealt with too. It's quite thought provoking too. One question that struck me again and again whilst reading was, quite a simple one but obvious one, what would you do if you were about to die and someone came to you, the way they come to people in the book? And you know what, I still don't know the answer. The first response would be: ARRRRGGGGGGHHH I'M GUNNA DIE! MUMMY! But then there's this niggling, what would you do to survive? If you know it'd save you, would you go, regardless of what you faced? Alex has used this brilliantly because although it's probably not meant to be that hard hitting, it gets me, and no doubt many others to read this book! The characters are a nicely mixed bunch too! They all come from completely different times so all have different little quirks. 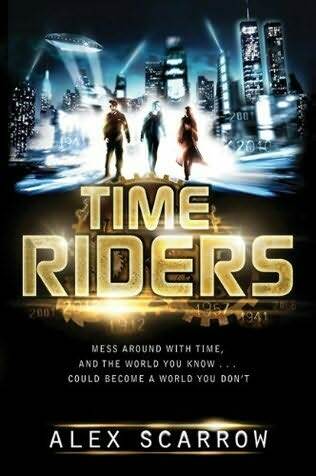 I'm finding it quite hard to summarise my feelings toward this book so I'll just finish by saying this: Alex has most definitely created a beauty right here and I am looking forward to getting around to number 2, Time Riders: Day of the Predator which is currently waiting to be dispatched from Amazon. Damn the Bank Holiday! This series looks set to be brilliant, up there with the likes of Anthony Horowitz' Alex Rider series. It certainly deserves to be as big, if not bigger. Young boys (I'd say 10-15 would eat this alive, and then the bigger boys (16+) will enjoy it just as much too. Bravo Alex! Bravo! Thanks for such a decent write-up, Ryan! Really glad you enjoyed it, particulalry the more mature, adult, themes. The series, gets darker, by the way. Darker and scarier. And i do hope you continue to enjoy it. If you want to know more, or watch the trailer...why not pop along to www.time-riders.co.uk?